he smells of mouldy cheese. so you can see his knees. It seems like I’m taking a childish turn of events over here. Its not a bad thing at all. I was going through my Kindle and realized I had at some point gotten this Stinky Santa book for free. Its two short stories set in rhyming poetry about the holidays. The first is called Stinky Santa which talks about Santa who doesn’t like to shower and smells a lot but then gets all nice for Christmas to deliver the gifts and goes back sweaty and dirty and goes back to his usual routine. Its a little silly but somehow quite fun and satisfying to read. Plus, the drawings are done pretty cute as well. It fits into what I think kids will enjoy. Plus, the writing runs off the tongue well especially because it does rhyme well so never feels too forced. The second story or poem (not sure what to call it yet) is what they say is a “surprise gift”. Its a nice little perk called Santa’s Grotty Grotto. Most people probably wouldn’t refer to Santa’s workshop as a grotto but here it works a little like Snow White and the Seven Dwarves or something where the place is usually empty and desolate and then it comes to life when it snows. Its a nice thought because even for myself, living in Canada, there is more Christmas spirit and holiday cheer when it snows outside and it just feels more suitable for the holiday season the way that I like it. Both of these stories is just fun and entertaining. It has some funny bits and a lovely reading experience. Plus, its quick and quirky which also fits into something similar to Dr. Seuss. I mean, there is no comparison because Dr. Seuss is always a gem to read and irreplaceable but I had some similar vibes here and there with the creativity and the silly nature of the material. It is a nice break from the novels and romance and all that stuff that I’ve been reading and watching so the change of pace works for me. Now for the reviews for the next 3 books! I apologize in advance if this post gets longer than usual. After the Ersatz Elevator, the Baudelaire orphans are shipped off by Mr. Poe to try out a new program called “it takes a village.” They agree because they finally see the initials VFD again and follow the clue to maybe finding their kidnapped friends, the Quagmires. They soon realize that VFD stands for Village of Fowl Devotees and this town is infested by a lot of crows and even more rules than one could count. Theu are fostered with a scared guardian called Hector and sent to do the everyone’s chores. If the previous three books are in the right direction, this story sets off some more of the same like a new group of oblivious people but also creates more action and tension as the secret organization they are seeking is a bit more enlightened. Plus, there are some puzzle solving as they track down the Quagmires and some funny and tragic moments along with the staple puns and phrases to add in that extra bit for the children readers to be acquainted in this fun way to learn some new vocabulary while indulging in a new story. Theres a lot to love about The Vile Village. The characters are very colorful for one and somehow the dilemmas or situations the Baudelaires get stuck in alwayd might end in one way or another in despair but this one ends with a victory or two or at least a little hope. With all the bad that has happened since the beginning even a little something going their way is a good thing. After the Baudelaires escape from VFD and now things are a little good since they did find the Quagmires, they find themselves in somewhat of a pickle as they are wrongly accused of murder leaving Count Olaf to be able to wander freely especially since he ia presumed dead but frames another. The Baudelaires meet the blissfully ignorant singing crew called VFD, Volunteers Fighting Diseases and end up at Heimlich Hospital. At the Hospital, they find another crucial and hopeful clue and this time do escape for the most part as they end up in a risky situation as well. Count Olaf and his crew are quite silly to say the least but they also are quite ruthless in their ways especially when their silly solutions are always believed by the clueless characters they encounter. It makes us wonder if it is a social commentary on the ignorance of society. Regardless of that, this one is a nailbiting story. The tensions ramps up as the orphans learn how to use Olaf’s tactics against him and start playing a little more smart to survive. The Hostile Hospital ramps uo the danger but rewards the orphans with a little more hope. Perhaps for children, they will see these orphans and not see how they haven’t learned but part of growing up is learning to adapt and the speck of reality here is seeing the orphans each grow a little and sometimes make hard choices that question their morals to make it through a dire situation. The tension definitely gets higher as this episode starts with the Baudelaire orphans’ escape in the trunk of Count Olaf’s car and end up at this deserted and worn out carnival called Caligari Carnival. With their wits, they try to mimic Count Olaf and get into a disguise to hopefully figure out more about VFD as the carnival leader and resident fortune teller, Madame Lulu has the symbol there. As this story ends, the orphans have never been in more danger than before. Hard to imagine, but its true. With that said, The Carnivorous Carnival is a lot of fun moments. There is a lot of great characters here especially with yet again more oblivious people particularly the House of Freaks, but then they are rejected normal people who are made to believe that they are freaks when in reality they aren’t and just being accepted somewhere makes them a little easily convinced into doing things to improve their life. It is one of the features that makes us cheer for the orphans as they are starting to have a few wins as they are learning more and meeting more people but still showing how each of their characters are developing. They should after 8 books before it and thrown into perilous situation after another and really only having each other to get out of these situations. The dark humor here works great. There’s a lot of love for this book that was another page turner. At this point, the story is pushed forward by how connected you are with these characters. Somehow, as much as these stories are linked, they never really need to know the previous book to keep reading which keeps it relatively self-contained. However, this is the first one that truly ends with a cliff-hanger. A Series of Unfortunate Events ramps up on the tension and danger elements for the Baudelaire orphans. It has some great danger elements and keeps with the vocabulary and popular phrase learning for the educational elements for the younger audience. As dark as the stories got, it still retained a bit of silliness in all its evil. Perhaps its the first time we start noticing the little social commentaries but it manages to constantly use a wide array of clueless characters which in all their useless and incompetence provides a level of entertainment but it accentuates how smart these children are and how they are adapting to their situations to try to escape from the grasp of Count Olaf. Its a fun collection to read and elevates the series for sure. Baking Through Disney has hit quite the snag but I am working on catching up on some Pixar and Disney titles in the meantime. I needed a lighthearted movie and decided to give Finding Dory a go. Following the success of Finding Nemo, Pixar continues in this universe with Finding Dory. While it still features our favorite father and son clownfishes, this time’s star is Dory and her search for her parents and where she came from. Dory is a great supporting character in Finding Nemo but the question here is whether she can carry an entire movie by herself and that was also my hesitation. Other than the Toy Story trilogy, lets just say that I’ve been disappointed with Pixar sequels so this one had the same idea as making a movie out of the Minions from Despicable Me (which I haven’t seen but will soon since it just landed on Netflix) and Penguins from Madagascar (which I have seen and reviewed here). They turn out fun and a good time but never quite has the meaningful and memorable punch that some of the Pixar movies have been able to deliver. The good part is that Finding Dory delivered everything I expected it to be. It was fun and silly and had some hilarious characters and moments. Was it a necessary movie? Probably not. Its fairly easy to see where the story was going to go but it was a cute, especially the baby Dory was absolutely adorable. It had a nice message about family, just as Finding Nemo had but somehow, it felt like it still lacked a little bit more substance, maybe its because it felt so much like watching a Finding Nemo movie that it lacked some uniqueness. There’s been a lot of sequels for everything kind of movie in the last decade (maybe longer) so its hard to not hope that a sequel can deliver a little more. With all that said, Finding Dory excelled with some fun characters to match up the vibrantly forgetful Dory, voiced by the ever so talented Ellen DeGeneres. Ellen herself makes me happy so its hard to not love having an excuse to watch Dory’s origin story. Dory, Marlin and Nemo are exactly as fun as you would expect them to be. Of course, some of the new characters really did make it a lot of fun. Hank is a cranky octopus who wants to escape the aquarium and helps Dory only to get her ticket out of there. In the process, his many octopus abilities helps them out a lot while still realizing that a big scary octopus like him still has his fears. On the other hand, much nicer sea creatures here is Dory’s childhood friend, a whale shark called Destiny who they used to talk to via the aquarium pipes and Destiny’s aquarium neighbor, a Beluga whale who had a concussion and thinks he lost his sonar abilities. All of them together is absolutely a riot and its a ton of fun to watch. Overall, Finding Dory is a fun entertaining adventure and while there was some predictability in it, its still an enjoyable Pixar film. Pixar always comes with great animation and colorful palettes. The underwater aspect gives it this cool touch. While still the movies and has some level of imagination is a nice entry point for kids to know about different underwater creatures, I would imagine. Other parents who post about kids reaction to animated films probably would provide a better opinion on this. I loved marine animals (and still do) since I was a kid so whale sharks, beluga whales and colorful tropical fish, etc are all my favorite things so this movie really hit the spot for me on that level. Fun fact about me: I’m a huge fan of Lindsay Lohan when she was a young actress even up to her teenage roles, probably ends around Mean Girls. I remember that I have no idea how I landed on watching The Parent Trap when I was young but it was long enough ago for me to not really remember too much of it. This was a pretty fresh watch. However, I’m big on these twin movies. I still love It Takes Two to absolute bits. After a month of horror, its high time for some more family fun sort of movies. I was saying that it was teen comedies but I think the correct term of it is family features mostly in November. Sometimes, we just gotta take it easy especially when my mind is in high panic phase or at least it will be soon if it hasn’t already. The best way to start this write-up is to first say that I haven’t watched the original The Parent Trap so I’m taking this one as a standalone, which it should be, even if it is a remake. The Parent Trap is kind of your cliche family movie. In many ways, I prefer It Takes Two over it if we were to compare, especially since there are many similarities between the two and I like the Olsen twins a tad more than a double of Lindsay Lohan. However, she does do a great job especially realizing that at a young age, she could do the British accent and the normal, plus there was some pretty fun parts. The Parent Trap isn’t a long movie either and carries some pretty entertaining times. First of all, the cast is pretty good. Playing the father is Dennis Quaid who I do enjoy watching from time to time. Oddly, most of them are family films, except for Vantage Point. However, the fun isn’t exactly with these two adults meeting again and rekindling their love in a few days and putting all differences aside. The over the top character of Meredith, makes for some funny moments especially when she reacts quite funnily and as annoying as this character would be in real life, it offers a comedic element. My favorite character, other than Lindsay Lohans, have to go to the characters Chessy and Martin (portrayed by Lisa Ann Walter and Simon Kunz respectively) because they play the father’s sister and the butler on the mom’s side and was the adults pulling the strings and they were just hilarious together. The Parent Trap does have some fun characters and that really elevate the movie quite a bit. The very young Lindsay Lohan is remarkable and cute. Probably one of the extremely shining moments of this rather cliche movie. In fact, having two Lindsay Lohans here shows the diversity of her acting. She doesn’t come off as bratty either. In fact, we actually can see the innocence of the two little girls here who really are hidden in the dark about having a twin and then not really understanding what made their parents fall apart but having that immense desire to put them back together since they are single still. Life (and love) is more complicated than that but the simplicity of Hallie and Annie does make for many fun moments. Most family movies work with a formula, and The Parent Trap is no different. However, it is surprisingly entertaining and has lots of great moments. Lindsay Lohan, Dennis Quaid, and the other cast are all having fun with their respective roles and giving us some cool characters. In that end, that is what matters, right? Lots of movies are formulaic, especially with the amount of sequels and remakes that we get in one year nowadays, but the feeling we get out of some of these family movies carry weight. The Parent Trap is a at many times not only fun but has its fair share of heartwarming moments as well. Have you seen The Parent Trap? How about the original? How do they compare? I’m guessing we all see something different based on where we live, what values we believe in and just what interests we have. For me, the world through my eyes is hard to determine. This doesn’t define my world per se but it does reflect the area where I’m in! Some nice shots from different angles and different events! Religion and beliefs in general! Beautiful architecture reflecting the endless possibilities of creativity that others bring into our world to brighten up our lives. I may not be a church-goer but I do believe in some form of higher power up there watching over us. I respect those with faith because its what gives us hope for a better tomorrow or simply motivation to live through every single day despite the things that have happened. Art can be shown and presented anywhere! This used to be along an emergency exit stairs..until this building is now empty, I believe. Back of a building in Chinatown! We see the beautiful world of loyalty in the eyes of our furry best friends! In this case, I saw it in the longing glare of my boyfriend’s sister’s father in law’s dog! She followed her owner everywhere and sat to wait for him patiently to come see her. Our world is also built by the youth that will one day be our future. They show us how to be naive and have fun with the most simple things in life. They remind us that time is fast every single year that we watch them grow up. Growing older year by year! Till when we see them being innocent and happy as they aren’t afraid to show who they are and how they feel. The world through my eyes is complicated in the social context but at the same time, I choose to remain hopeful and positive. We can see the happiness that surrounds us with our family and friends. We can remember to stay naive and sometimes nostalgic as we become kids with the children around us, as we laugh with them and smile when we see their eyes sparkle with joy! We can find enjoyment in seeing the creativity, thought and passion involved in everything surrounding us. Weekly Writing Challenge:Warmth, Comfort and Security..A Few of My Favorite Things! My favorite thing, above everything in the world, has been a part of my life since I was a baby. Its been with me through thick and thin. Guessed what it is yet? Thats right! 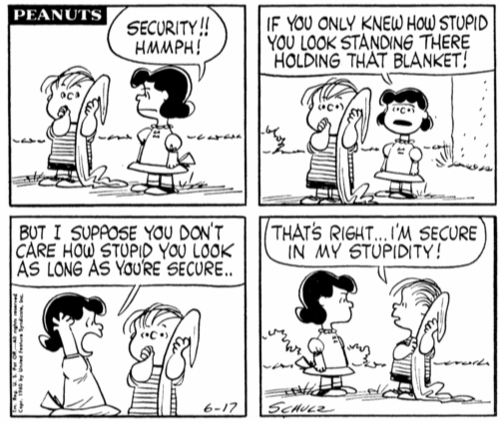 Its a security blanket, as I call it “my blankie”. Mine is white with tabby orange flower and leave patterns. It only can cover my lower body now but in times of sadness, I can still tuck myself under the whole thing (all curled up). My mom is like Lucy of Peanuts. She wants to take every chance to throw it away but hasn’t succeeded yet. I hope that she doesn’t either. My security blanket was always solely for my bed. I would never drag it with me everywhere but it was my comfort at night. It helps me sleep better, protects me from nightmares, and makes me feel that much better about being alone in the dark. I’ve somewhat grown out of my fear of the dark(as long as I stay away from horror movies) but its still my shelter and helps me sleep just a little bit better when I feel that its around. The blanket may have gone through 26 years (for now) with me. Right now, my blanket still has the same floral pattern surface but with little slits with stitches and mendings that were done over the years. The whole bottom layer pretty much broke off. Thank goodness, my mom sewed on 2 extra layers to cover up the “fluff” inside. Even the inside fluff is starting to break apart. It may be damaged but it has been through so much that I would want to fix it no matter what and keep it by my side. Sometimes just by holding it, it gives me the strength and courage to be ready for whats coming the next day. 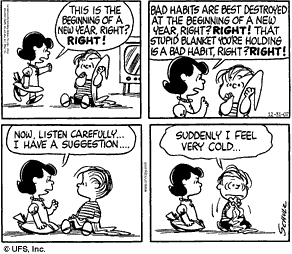 CB: Why don’t you don’t let me try to find some sort of substitute for your blanket? Maybe I could get you a dishtowel or something. A security blanket may not be there all the time. It just helps to know that we have something that we can just sit with when you are little and as you grow up that will be there to offer you that little bit of comfort. When I was little, I was overcome with insecurity so that was how the blanket became something important in my life. I use to actually have another one too and it looked exactly like Linus’. It was blue and was a smaller size than the one I still own now. That one broke somehow and to the extent that couldn’t be salvaged so I had to let it go. One day, this blanket may end up just like the blue one. I would eventually want to make it into a quilt or something that can be carried with all the significant memories for any future kids to see. I haven’t thought that far yet. For now, I’m going to enjoy my security blanket because it makes me feel secure in the dark nights, provides comfort in hard times, chases away worries and haunting nightmares. It provides me with the warmth and happiness that only it can do always do. 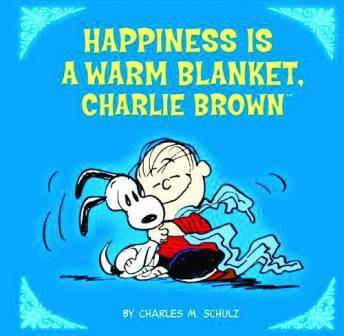 Afterall, happiness is a warm blanket!